Human beings should not be trusted with large quantities of money. We've got Elon Musk incurring fines by the millions for tweeting irresponsibly, we've got folks inhaling pizza topped with 24K gold, and at some point this week, everyone forgot how to eat a burrito properly. Maybe, we don't deserve to be the breadwinning species any longer. Forbes has been ranking the wealthiest people in the world for years, but what if it's time for a different capitalist approach? Insurance aggregator Compare the Market just launched its inaugural Pet Rich List this past Thursday, so when you get tired of all the wealth falling to folks with opposable thumbs, you can take a look at the bougiest dogs and cats (and one handsome chicken) in the world at large. Yes, you read that correctly. Giggoo is a hen. The feathered creature was owned by multi-millionaire British publisher Miles Blackwell, who left him a casual $15 million in his will. He died just weeks after selling his business, and now Giggoo won't have to work a day in his life. These handsome pups belong to none other than Oprah Winfrey. Luke and Layla are golden retrievers, Sadie's a cocker spaniel, and Sunny and Lauren are springer spaniels, all of whom serve as regular guests on Winfrey's Instagram. The media mogul, who tends to be remarkably sensible, has agreed to leave $30 million to them in her will. It should come as no surprise that Ms. Olivia Benson is one of Taylor Swift's two beloved cats. Not only has she made quite the name for herself on T. Swift's social media, but she's also appeared in adverts for Diet Coke and Keds shoes, earning her a substantial amount of independent wealth. Naturally, she is named for Swift's celeb crush on Law & Order: Special Victims Unit. An icon for feminism. 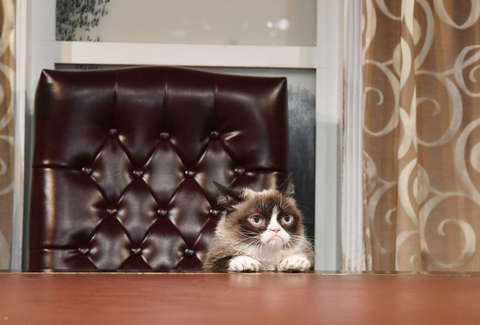 Made famous on Instagram, Grumpy Cat is a global feline phenomenon. Technically named Tardar Sauce, she's best known for her eternally grump demeanor, hence the nickname (you'll find many a meme of her scowl). She continues to make media appearances to upkeep her social status, she maintains a full merchandise empire, and in the 2014 film based on her life, Grumpy Cat's Worst Christmas Ever, she's played by Aubrey Plaza. Gunther IV is the lucky heir to the enormous fortune left to his father, Gunther III, who earned his wealth from his human, German Countess Karlotta Leibenstein. With frequency, he dines on steak and caviar, and he enjoys his own personal maid and butler. Same. Now, doesn't that make you feel better about the state of the union for homo sapiens? Eliza Dumais is a news writer at Thrillist whose formerly-stray cat recently peed in her backpack. Follow her on Twitter for proof.